We have collected and analysed 26 user reviews from international sources. Users rate it 82/100. The average review date is 11-07-2014. We have compared these reviews to 315962 reviews from other Coffee & Espresso Makers. The alaScore™ for this product is 85/100 = Very good. Last update: 24-04-2019. My only big beef with my new Tassimo is that it takes an acrobat, or my long-armed husband, to put the water tank in and out. I am disabled, so that is very important to me. The first machine did not work at all. The your representative worked with me to no avail. I new machine was ordered, old one sent back everything is working now. The machine is handsome. 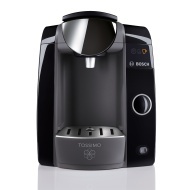 It is a bit quirky but when it does work properly, it brews better than our previous versions. Expect better performance from Bosch.